The 6.8mm SPC is one of the more popular cartridges to emerge from the controversy surrounding the terminal performance of the 5.56x45mm M855 cartridge in the early 2000s. It was suggested by ‘reports from the field’ that hostile persons were being shot with the M855 (from a M4) and were not stopping immediately once they were hit. There are a few problems with this and I will address those problems now. It is difficult to see where a bullet hits on a bright sunny day, with all conditions perfect. Bullets are already far within the target before any significant deceleration can take place. This holds true for all target materials except for metal plate—the results of an impact with a bullet are usually pronounced enough to observe. The first assumption about the ‘failure’ of the M855 relies on the assumption that the target was actually struck by the bullet and not fired at and missed (a common occurrence during combat) . The M855 was designed to be fired out of a 20” or longer barrel. When a barrel is shorter, the velocity of the bullet will be decreased because less of the propellant will have the opportunity to deflagrate before the pressure in the barrel is released by the bullet exit. The M4 is a handy rifle and it was originally procured for Special Forces units in the 1980s. Special Forces units typically have a large degree of separation from the ‘Big Army’ logistical system and can often quickly buy mission-essential equipment. This rapidity is almost a foreign concept when talking about procuring equipment for larger organizations like conventional armies. The shorter length of the M4 eventually found favor with conventional units, so the M16A2 is in the process of being phased out of service with the US Military. The M855 and M193 will fragment inside of the target when shot out of a M4 but the terminal effects are somewhat unimpressive when the range begins to exceed 100 meters. Things take time to work in the military logistical system … there was a span of twenty years between the introduction of the M4 and any effort to redesign the military service ammunition to work effectively with this shorter barrel length. 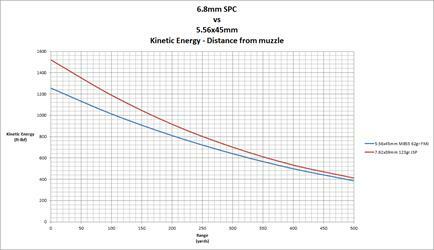 If the 6.8mm SPC has kinetic energy levels similar to the AK47 round, why don’t we just buy an AR-15 that is chambered for the 7.62x39mm round? There are a few reasons for staying with the 6.8mm SPC: muscle memory, bullet selection and cartridge weight. If you have practiced clearing malfunctions on your AR-15 while keeping your eyes focused on the target you will have to do something to adapt to the new placement of the magazine release button on a 7.62x39mm AR-15. The latch for the AK47 magazine is located at the rear of the magazine while the latch for the M16 magazine is located on the side. You now have a problem—a gun that feels like an AR-15 (which should cue your muscle memory into making the correct movements to operate an AR-15) but will not release the magazine no matter how many times you jam your index finger into the side of the magazine well. If you are in this situation, I would recommend highly that you buy some kind of aftermarket pistol grip, heat shields and buttstock. Make your different gun feel different than a factory AR-15. Use only one type of AR-15 during your practice sessions. Clearing a double feed usually starts with locking the bolt carrier of a firearm to the rear by manually activating the bolt hold-open/release lever. If you don’t physically have a bolt release on your gun, you must discover some alternative method for clearing this slow-to-fix jam. Maybe by holding the charging handle fully rearward with one hand while using your fingers to clear the malfunction in the chamber. This requires removing ones firing grip on weapon and will make it even slower to come back on target once the jam is cleared. The last point that I would like to bring up is the issue of ammunition weight and real estate on your web gear. AK47 magazines that hold 30 rounds are curved (called “banana clips”) to feed the ammunition reliably into the gun. If you own a gun that can fire at least 400 times before needing to be cleaned (AR-15), it would make sense to carry 400 rounds of ammunition maximum if you felt the sky was about to fall and a rifle is the only medicine for the job. The basic ‘chest rig’ that can hold 6-8 30 rd AK magazines are easy to find but the magazines are usually made of steel, which makes them heavy, and the curvature makes them awkward to carry in a vest. Ammunition supply is the deciding factor in many fights in history, so it pays to have a lot extra if you are carrying a gun for self-defense. The 6.8mm SPC makes it somewhat more efficient to carry all of that extra ammunition. 6.8mm SPC AR-15s offer you the ability to carry over your training and experience with the AR-15 series into a more powerful firearm that has a longer effective range and close-quarters lethality. You get AK47 (and 30-30 Winchester for that matter) ballistics in a package that holds 25 rounds in the space of a standard 30-round USGI magazine. I highly recommend that you try a 6.8mm SPC rifle if you feel that you are proficient with your 223 Remington rifle. At left is a video comparing the 223 Remington to the 6.5mm Grendel, 6.8mm SPC and the 50 Beowulf in the AR-15 platform. Bare gelatin was shot, as were car door fixtures and car windshield fixtures backed by gelatin. FBI Standard test fixture that addresses bullet performance if you have to fire through a windshield to hit the target.